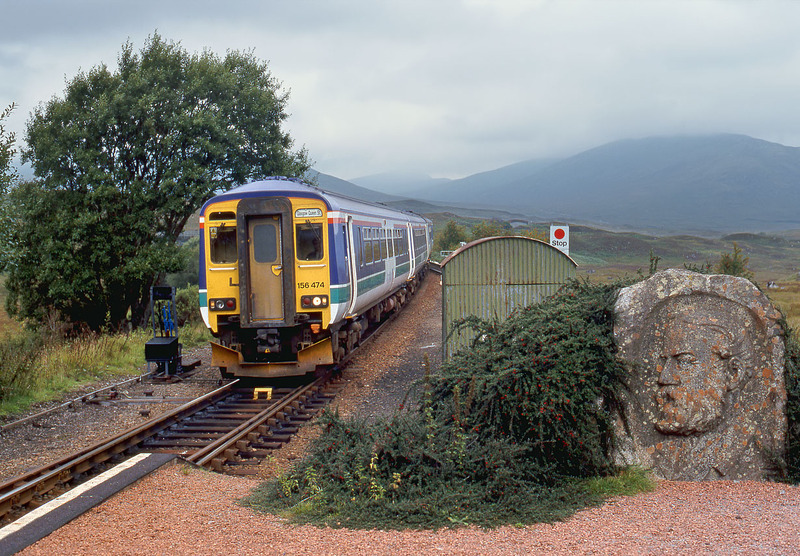 156474 & 156462 arrive at Rannoch station with the 10:30 Mallaig to Glasgow Queen Street ScotRail service on 4 September 2000. This train will be combined with the 12:35 service from Oban at Grianlarich and will therefore go forward as a six car formation. Prominent on the right of the picture is the memorial to J. A. Renton, a director of the West Highland Railway. During times of economic difficulty whilst the line was being built he personally provided extra money for the project in order to get the line completed. The navvies responding by providing this memorial.